Creating royalty is a bee’s specialty! The most important single bee in the hive starts from a fertilized egg which is actually exactly the same type of egg as any other worker bee. Drones (males) are actually unfertilized eggs, but more on that in another post! 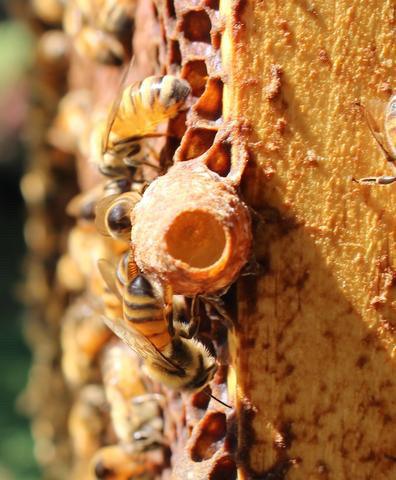 Depending on the situation in which the colony finds itself needing a queen the egg will either be laid in a queen cup (a cell designed specifically for raising a queen-planned) or a worker cell (these are used to make a queen in an emergency situation-unplanned). In the picture above you can see a queen cup. Typically bees will keep a few queen cups in the hive just in case tragedy strikes the queen. 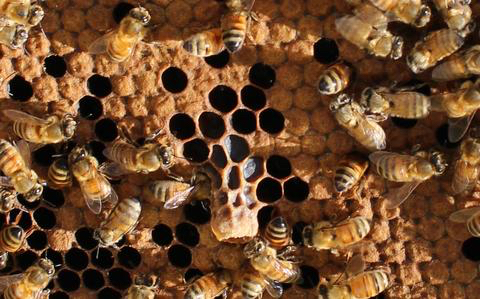 The first three days of a queen’s life are spent as an egg, similar to workers and even drones. Eggs are laid upright and require no feeding until they hatch. Once the three days have passed the egg hatches into a larvae and this is where her highness starts to get special treatment. So what happens now?? The key is all in the nutrition. As mentioned earlier just after hatching worker larvae and queen larvae are the same. Larvae that are to become queens get fed royal jelly. Nurse bees consume honey and pollen and then convert it into royal jelly which is excreted from a gland in their head. Worker bees are fed worker jelly for their first two days, and bee “milk” for the next six. This mixture is similar to royal jelly but with lower vitamin and sugar content. Queens are fed royal jelly continuously and lavishly, so much so that the float in a pool of it! This continues for 8 days until the now larger queen cell is capped or completely closed (workers are capped at 8 days as well). 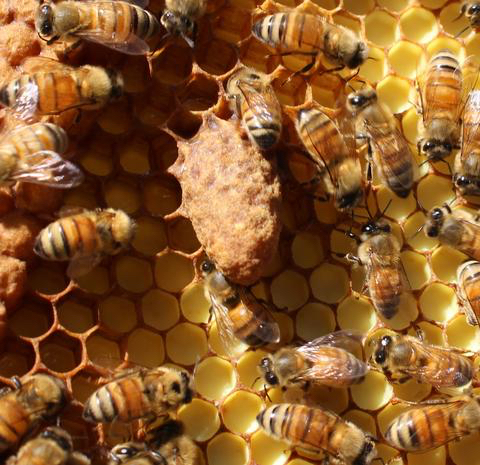 This nutritional boost is what allows the queens to fully develop their reproductive organs. They also need a body that will last them through (hopefully) multiple years of laying up to their body weight in eggs daily (2000/day). So her highness (the larva) is now floating in a pool of food and capped in her cell! The change from larvae into queen bee has begun. In the another post we’ll talk about the big hatch, how queens battle for supremacy and the most important flight of their lives!! The first picture shows and open queen cell and the royal jelly and larvae, while the second shows a capped queen cell from which the queen will emerge. Make sure to share this with your Little Keepers! They love this stuff! Here’s a hint – it all starts with the jelly! More in our next post. The attached pictures show an egg, a queen cup, a close-up of a queen just in case you haven’t seen one, and the last is a fun challenge to see if you can find the queen on the frame (this is an easier one!